After falsely alleging that 3 million to 5 million people voted illegally in 2016, Donald Trump debuted a new lie about voter fraud in a meeting with senators on February 10, saying, according to Politico, that “thousands” of people were “brought in on buses” from Massachusetts to “illegally” vote in New Hampshire. Trump claimed that’s why he and former GOP Sen. Kelly Ayotte lost their races in the state. “For the record, you have provided absolutely no evidence,” Stephanopoulos responded. Miller could provide no evidence for Trump’s claim because there is none. “We have never gotten any proof about buses showing up at polling places,” New Hampshire Secretary of State Bill Gardner, who’s been in office since 1976, told The Boston Globe. “I will pay $1000 to 1st person proving even 1 outofstate person took bus from MA 2 any NH polling place last ElectionDay,” tweeted former New Hampshire GOP chair Fergus Cullen. Republicans in New Hampshire have made similar claims for years with no evidence. “The Democrats are very sly.… [in New Hampshire] we have same-day voter registration, and to be honest, when Massachusetts elections are not very close, they’re busing them in all over the place,” gubernatorial candidate Chris Sununu said five days before the election. Politifact called Sununu’s statement “ridiculous” and gave it a “Pants on Fire” rating. “We haven’t had any complaints about widespread voter fraud taking place,” New Hampshire Deputy Secretary of State David M. Scanlan, head of the state’s Election Division, said after the election. Both Trump and Ayotte could have requested a recount in New Hampshire if they believed there was foul play, but did not. Yet here’s why Trump’s lies about voter fraud are so dangerous: Republicans in New Hampshire, who now control the state government, have introduced 40 bills in the 2017 legislative session that would make it harder to vote. What’s happening in New Hampshire is part of a disturbing national trend. 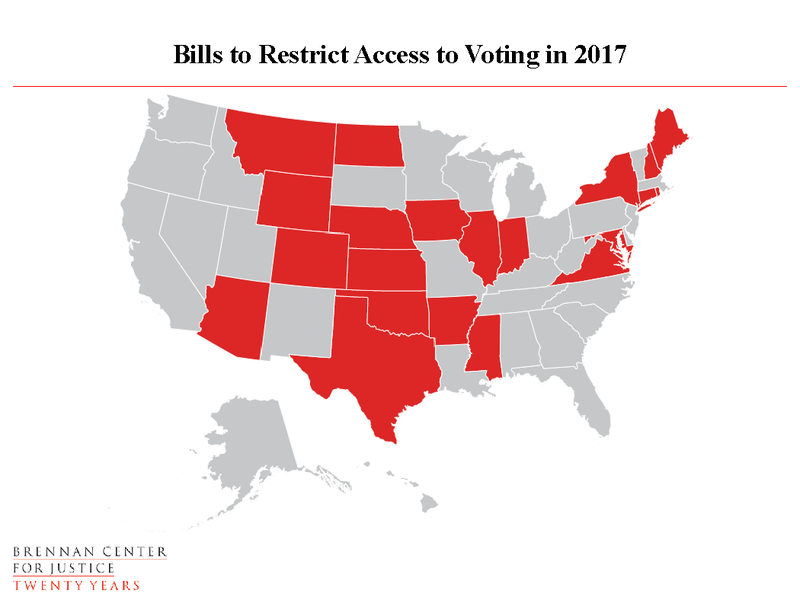 Already this year, 46 bills have been introduced in 21 states, mostly controlled by Republicans, that would make it harder to vote, according to the Brennan Center for Justice. At least 12 states are already considering stricter voter-ID legislation — Arkansas, Illinois, Indiana, Maine, Maryland, Montana, Nebraska, New Hampshire, New York, North Dakota, Virginia,and Wyoming. Arkansas and North Dakota’s bills have already passed in their state Houses. Legislation from the Iowa secretary of state to implement voter ID will likely be considered in the legislature, with the possibility of more restrictive bills originating in the capital. Along with Virginia, Texas legislators have introduced legislation that would create strict documentary proof of citizenship requirements to register. In Connecticut, Illinois, Iowa and New Hampshire, legislation has been introduced to eliminate or limit Election Day registration, and bills that restrict students’ ability to claim residency where they live and go to school have been introduced in Arizona, Maine and New Hampshire. Legislators in Colorado, Illinois, Iowa and Texas have introduced legislation that would cut back on early-voting opportunities. Numerous states have seen legislation that threatens individuals or groups who help others vote or register. Legislation making it more difficult to help others deliver their absentee ballots has been proposed in three states: Arizona, Montana and New York. Virginia legislators have introduced burdensome requirements on community-based voter registration, along with increased penalties for alleged misconduct. In Texas, a bill has been proposed to make it harder to offer voter assistance, undermining a court settlement last year. The Trump administration is likely to massively intensify GOP voter-suppression efforts, especially with Jeff Sessions leading the Justice Department. “The issue of voter fraud is something we’re going to be looking at very seriously and very hard,” Stephen Miller said on This Week, falsely claiming that 14 percent of noncitizens were registered to vote. The Trump administration’s sham investigation into voter fraud will be a prelude to future suppression efforts, which could include forcing states to purge their voting rolls in inaccurate and discriminatory ways; launching bogus prosecutions that target voters of color, like Sessions did as US Attorney; switching sides in existing Justice Department cases by backing restrictive voting laws in court; and pressing Republicans in states and Congress to pass voter-ID laws and proof-of-citizenship requirements to register. We’re already seeing how such efforts can have a chilling effect on political participation. Last week, the state of Texas sentenced Rosa Marie Ortega, a permanent resident and mother of four, to eight years in jail and certain deportation thereafter for mistakenly voting in 2012 and 2014. (Ironically, she was a registered Republican.) The outrageous sentence is, unfortunately, a preview of what’s to come. We’re having the entirely wrong conversation when it comes to voting in America. Seventy-eight House Democrats wrote to Trump last week and reminded him that the 2016 election was the first in 50 years without the full protections of the Voting Rights Act and that 14 states had new voting restrictions in place for the first time. Instead of perpetuating the myth of voter fraud, we should be investigating how thousands of legitimate voters were blocked from the polls.